Hi eveybody. 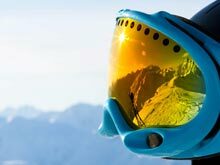 Right then, I reckon it's time to start thinking about skiing again don't you? What with the chilly mornings now, and early autumn snowfalls out in the Alps already. So here is a little tale from last season that I never got round to telling. 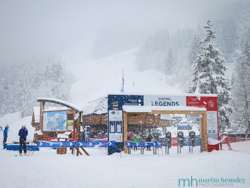 Back in early March I received a phone call from Alain, the big cheese at the time of Méribel ESF. All he said was "we need to talk" (in French, obviously). If you were to get such a call from your boss, the feeling of fear might set in for some of you. My way of dealing with this? Putting my head in the sand (snow?). But of course that wasn't going to last long. Sure enough the next day Alain saw me down at the ski school, and walked across to me. "Martin........ can I ask for your help this Friday morning?" How do you answer that without knowing what you were going to be asked to do? "Yes of course Alain." I swiftly replied! "Fantastique, please come to my office this evening and I will explain more". Even after twelve years of working for the ESF, I still sometimes get a little intimidated by the scale and presence that the school has. After all, the ESF has a very strong profile that each and everyone has opinions on, especially the British public. At the school there will be times when I feel like an outsider, being one of just a few British instructors. Having said that they are a fantastic bunch of people, and I now have many close friends there. On a similar subject, pretty much every day on the mountain, British visitors (and French I might add) will stare at me when they hear me speak with my English accent. Granted, I may not be the best looking of chaps, but there is no need to stare. In fact many people will say to me that they thought the ESF was a 'closed' shop when it comes to the British working for them. This is a huge subject, and articles have been written about this on many occasions, but this couldn't be further from the truth. I won't discuss this subject any further this time round, other than saying that the ESF have welcomed me (and many other British instructors) with open arms. Ok, gone slightly off at an angle there. Back to my meeting with Alain that evening. He explained that both Méribel and other ESF schools were looking more into the way they are being marketed. This itself is a massive undertaking, and one where they are enlisting various people to help. 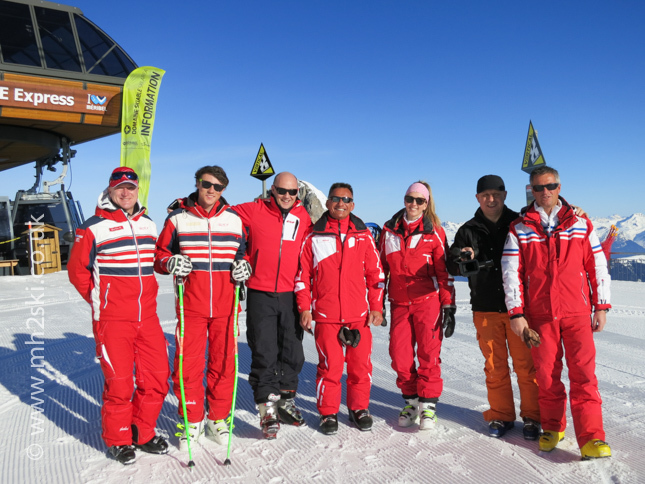 Alain explained that a small company, which runs under the name of UK-ESF, was coming out to the Three Valleys in what was just a few days time. 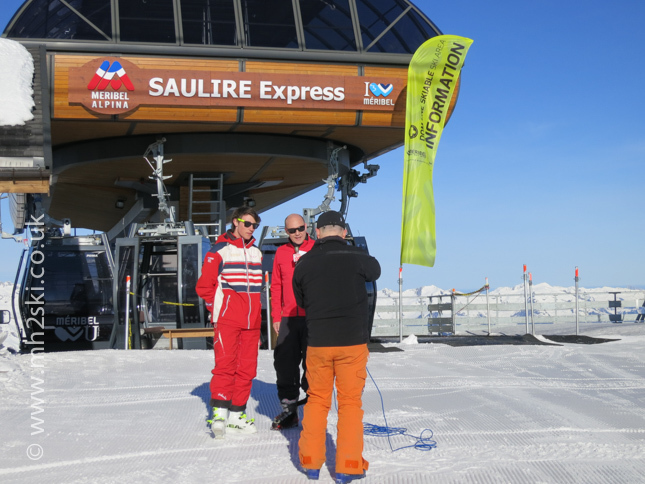 The plan was to make a few videos early in the morning, at the top of the Saulire lift, before the ski lifts were opened to the public. 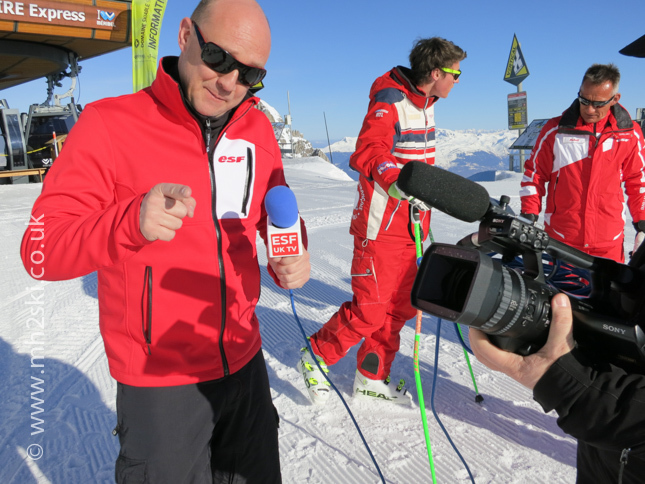 Alain explained that he wanted me and another British ESF instructor to take part in some interviews whilst being filmed. 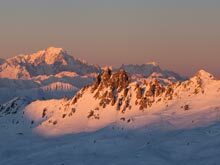 The only slight catch was that we had to use the ski lifts in Courchevel, and not Méribel, to get to the top of Saulire. No problem of course. The time that Alain suggested to pick me up in the car was a tad early, 7.15am. Which meant getting up at daft o'clock in order to wash behind my ears, and all the other necessary things one has to do in their early morning routine. 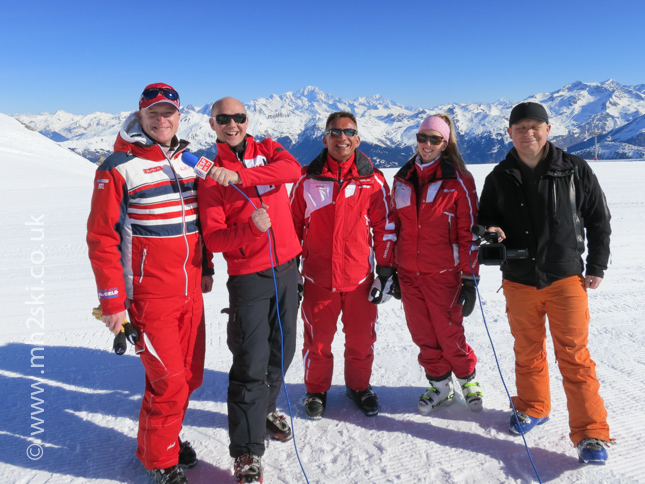 As soon as Alain, myself and Greg arrived at Courchevel we were introduced to two other British ESF instructors, this time from Courchevel La Tania. This was great, because I had now met new people who I would recognise on the mountain in the future. So there was a flurry of handshakes and French kisses all round, as is common in France, with anyone and everyone. And off to the lifts we went. It was very special riding in bubbles and a cable car so early in the morning, with just a handful of people around, notably us and a few pisteurs. And the quietness at the top of the mountain was incredible, a very different experience to normal lift running times. So there we were, enjoying the scenery. Then Eric produces his video camera, Mark his fluffy microphone, and reality kicked back and I suddenly got very nervous. How daft is that? My summer job as a wedding photographer means I photograph lots of people, but as soon as a camera is pointed at me.......... Anyway, we were all briefed on what we were going to be asked a few minutes before each session. We of course got tongue-tied a few times, and had to re-record. But I guess even the 'pros' have this. Here is a link to one of the YouTube clips. What do you mean "Don't give up the day job Martin"? How rude. Actually, that's fair enough, I won't give up my day job. It was fun watching the other British instructors being filmed as well. Just before we packed up to head off to another location to film, the first of the skiers came off Méribel's Saulire Express bubble. 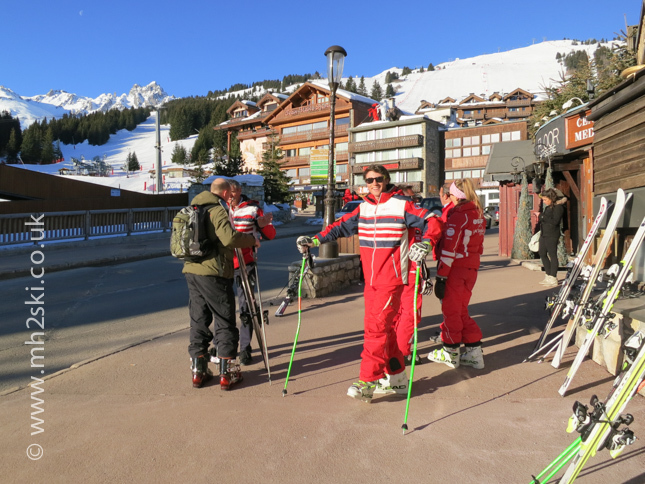 Some people love to try to get on the very first lift up in the morning to have empty pistes to themselves on their first ski down. Some of them looked a little confused when they saw us up there already. Either that or our English accents in ESF instructors unirforms had baffled people yet again !?! It was time to ski down ourselves to have a well-deserved coffee. I wonder if you recognise where this next clip was filmed? Bit of a giveaway really. It was a fun morning, meeting new people including fellow instructors, and soaking up the gorgeous March sunshine on the mountain. I'm still waiting for the royalties to start rolling in, not holding my breath there - or maybe the coffee was enough reward! If you enjoyed this article, you might like to head across to another blog post from last winter, click here for the link. Feel free to share away on Facebook, Twitter and Google+ by using the social media icons. Or leave a comment below. I'll post another blog post in a couple of weeks time. See you soon. Martin.